Platinum group elements (PGEs) are scarce in nature and have very limited deposits of economic importance world over. The deposits have very low tenor and require pre-concentration to recover the PGE values. Compared to world occurrences, only a few occurrences have been so far reported in India. Out of them, Boula-Nuasahi occurrence is one where PGE mineralization is confined to a narrow breccia zone and the grade is very low (<2 ppm). Ferrochromite and Base metal sulfides are two important hosts for this mineralization. Chalcopyrite and pyrrhotite are the main sulfide minerals present in this sample. Tremolite is the major silicate mineral followed by chlorite, enstatite and riebeckite. Chromite is the only primary oxide mineral present. Sudburyite and sperrylite are major PGE minerals. Other PGE minerals such as braggite, laurite, michenerite and testibiopalladite are also present. The PGE minerals exhibit associations with ferrochromite, sulfide and silicate. The minerals are of very fine size with the average size less than 20 micron. Very low grade and complex mineralogical attributes coupled with very fine size, make processing of this scarce resource very necessary and important. An attempt has been made to pre-concentrate the PGE values using different gravity separation techniques. A laboratory model KC-MD3 Knelson concentrator performed better compared to the others. The operating variables such as; G-force and fluidization pressure are varied to maximize the recovery and grade. 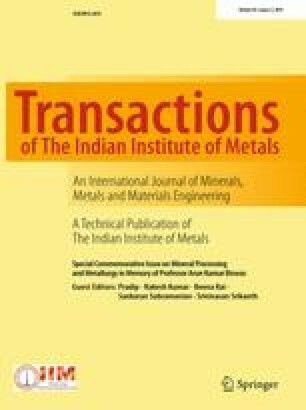 The authors are thankful to the Director of CSIR-IMMT for his kind permission to publish this work. Sincere thanks are due to Dr. M. Satyanarayanan, Senior Scientist, CSIR-NGRI, Hyderabad and Mr. R. Saini, TO, IIC, IIT, Roorkee for their cooperation and support for PGE analysis by HR-ICP-MS and EPMA respectively. The financial assistances from Council of Scientific and Industrial Research (CSIR) and Ministry of Mines, GOI, New Delhi, in the form of research projects are highly acknowledged. FICCI Mines and Metals Division, Development of Indian Mining Industry—The Way Forward, New Delhi (2013), p 120. www.ficci.com. Petrov S V, Nazimova Yu V, and Bogdanovich A V, Applied PGE mineralogy and ore beneficiation of the Galmoenan Deposit, Northern kamchatka, in 11th Intl Platinum Symposium, 21–24 June, Ontario, Canada (2010). (http://11ips.laurentian.ca/ Laurentian/Home/Departments/Earth+Sciences/NewsEvents/11IPS/11IPSHome.htm?Laurentian_Lang=en-CA). Kaukonen R J, Luukkanen S, and Maksimainen T, Mineralogical investigations of small scale beneficiation tests of some sulfide poor PGE occurrences, in 11th Intl. platinum Symposium, 21–24 June, Ontario, Canada (2010). (http://11ips.laurentian.ca/ Laurentian/Home/Departments/Earth+Sciences/NewsEvents/11IPS/11IPSHome.htm?Laurentian_Lang=en-CA). Kelvin M A, Sylvester P J, and Cabri L J, Characterization of PGE occurrences in the Ovoid of the Voisey’s Bay Ni-Cu-Co deposit, Labrador with applications to Mineral processing, in 11th Intl. Platinum Symposium, 21-24 June, Ontario, Canada (2010). (http://11ips.laurentian.ca/Laurentian/Home/Departments/Earth+Sciences/NewsEvents/11IPS/11IPSHome.htm?Laurentian_Lang=en-CA).